This morning I spotted a pair of bluebirds checking out the box I hung last spring. Last spring, I hung the box just a little too late in the season and it's been empty all year. 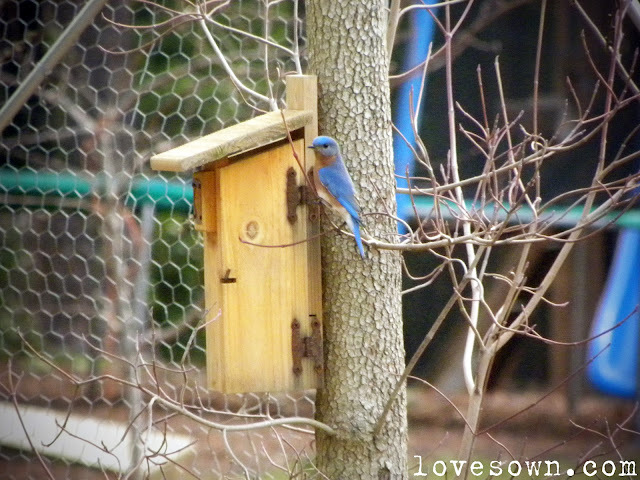 Sadly, after snagging this picture, my boys went screaming through the backyard, and the bluebirds flew off. I've enticed the boys back inside with animal crackers and Curious George, just to give the nesters a chance to realize my yard isn't that terrifying. I'm seeing some fluttering around the box again! I think I'll take the boys to a park since it is so lovely outside.